Four years ago this week, I made the single greatest investment of my running career - the Garmin Forerunner 405. I was trying to shake free from an extended period of laziness and, quite frankly, disinterest in any training whatsoever. So on a whim, I thought I would give one of these new-fangled GPS watches a try. That chance decision (I was passing through a sporting goods store in Iowa while on a business trip), not only got me back on the right track, it is likely the only reason I ever attempted to run a marathon. I have written often on the benefits that come with satellite tracking, virtual pacing, heart rate monitoring and the like, so you can check out some of those posts under the subjects of ‘Garmin’ or ‘Gear.' What I will share here is more the story of an ordinary man, driven by a structured plan and the technology to make executing the plan incredibly enjoyable. To say that the data I outline below would have been unthinkable four years ago, is a gross understatement. But the truth is, these results all started with an initial first step, and just a few more steps after that. Then came downloading those steps, analyzing splits, reviewing courses, assessing elevation gain, recording calories, on and on -- isn’t this unbelievably fun! But before we talk numbers, I have to tell you, with heavy heart no less, that Garmin 405 moved on to that great runner’s time piece place in the sky this past week. So we celebrate an anniversary and we mourn my little running buddy’s passing. In 405’s honor, let’s now reflect on the best four years of my running career. * Logged 738 runs together, or exactly 184.5 runs per year, or just at a run every other day. * Traveled 4,959.83 miles, or 1,240 miles per year. 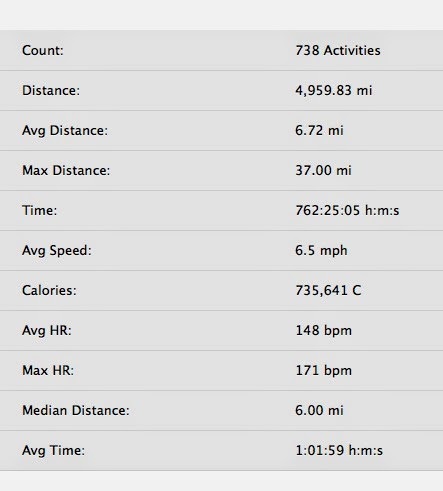 * Averaged a distance of 6.72 miles. * Run for an average duration of 1:01:59. * Been on the move for a total of 762 hours, 25 minutes and 5 seconds, or just under 32 days of running, if calculated at 24 hours a day. And finally, the biggest number of them all .... Forerunner 405 and I have burned 735,641 calories in these past four years, the equivalent of 3,503 Krispy Kreme original glazed donuts. I think you would agree this was the most genius purchase I’ve ever made! Now we press forward, forgetting what is behind. 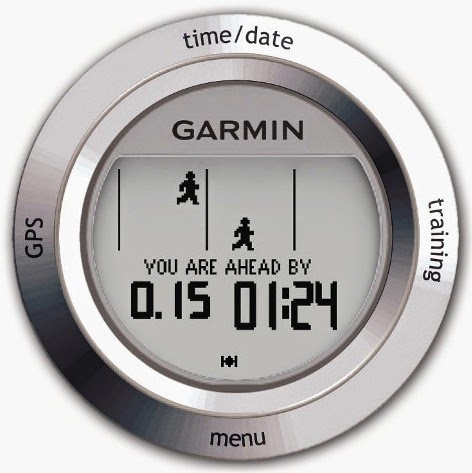 In doing so, I will have Garmin 610 to keep me company. We can never replace 405, but we can create new memories with 610 and hopefully have an opportunity to look back in four years at a whole new set of unthinkable numbers! An ordinary guy, one step at a time. Farewell, 405! Mine is aging poorly as well and I've been using a non-GPS watch since last fall. So far, the 610 has worked very well. I sometimes worry when it is finding signal, I think it takes longer than most of the ads and reviews says it should, but maybe I'm just impatient. It has not failed me and the touch screen is much, much, MUCH better than the bezel. By the way, if you don't mind, what do you use "non-GPS watch?" Are you just focusing on time vs. distance? Steps to calculate distance? Hope all is well. I'm sure you are probably training for some 100 mile adventure in the near future! Take care.